Upon arrival at Hanoi’s Noi Bai Airport, our representative will welcome you and transfer you to hotel in Hanoi. 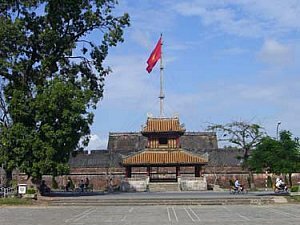 The rest of your day is at leisure for independent exploration – just catch a sight of Ho Chi Minh mausoleum or explore the maze of streets in the city's fascinating Old Quarter where you are certain to find something unique to buy. 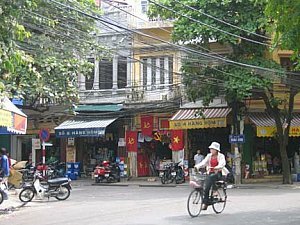 Hanoi, the capital of Vietnam, is a charming city of about 5 million people, famous for its beautiful lakes, shaded boulevards and public parks. The city centre is an architectural museum piece, its blocks of ochre buildings retaining the air of a provincial French town of the 1930s, contrary to the fast living and bustling air of Saigon. 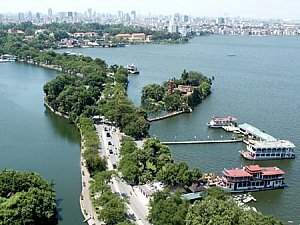 As Vietnam develops to compete with other South East Asian countries, Hanoi's Hoan Kiem Lake reflects the modern office buildings, old Buddhist temples and tangle of ancient streets. The city hums with the never ending flow of bicycles, cyclos, latest model Mercedes Benz and everything from the racy new Honda Dreams to 30-year-old Russian motor bikes. In the afternoon we attend a performance of traditional water puppetry before boarding our overnight train for Lao Cai. 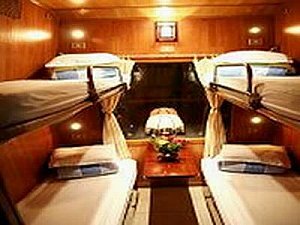 We travel in air-conditioned comfort in our soft sleeper cabins! 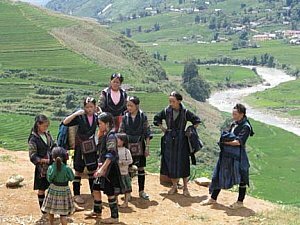 The train arrives in Lao Cai at about 6:00 am where our guide will welcome you. Look for the sign bearing your name when you exit the train station. Then take a morning drive through the clouds by car to Bac Ha (about 2.5 hours). On the morning of day 4 our guide will come to hotel and pick you up for a short walk along buffalo paths and trails through several hill tribe villages of Lao Chai and Tavan, home to H'mong, and Dzay people. This is a absolutely spectacular walk through stunning scenery inhabited by some of the friendliest people you can meet. The remainder of your day is at leisure to explore this fascinating hillside town. In the afternoon we depart for the Lao Cai train station. We have dinner here before boarding the train at 8:30 pm back to Hanoi. Arrive in Hanoi by 4:30 am, our representative will welcome you and transfer to your hotel for breakfast before going to Halong Bay. This morning we take a 4 hour drive to Halong Bay . En route there will be a short stop at the Sao Do centre run for and by handicapped children. On arrival we board our deluxe junk, this traditional wooden sailing junk boat offers a unique way of navigating the limestone karsts of Halong Bay with all the comforts of a motorised, floating hotel. Once settled in, you start your cruise round the majestic Halong Bay , while enjoying a delicious lunch. After lunch you have the chance to explore some of the limestone caves dotted around the bay. Then, the captain will find a secluded spot where you can swim in the clear water of the bay, soak up the sun on the top deck. In the evening the cook prepares a sumptuous meal as the boat weighs anchor in the heart of the bay. On the morning of day 7 we may be able to visit Dong Trieu ceramic village as we make our way to Hanoi. We should be back in Hanoi at around 3pm. Leaving Hue, our journey takes us south through rural countryside and the picturesque fishing village of Lang Co before ascending the dramatic Hai Van Pass, past stunning rural and coastal scenery, to the town of Danang. 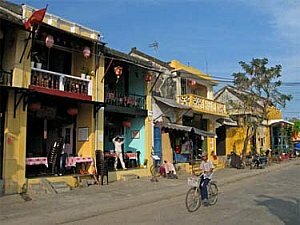 We drive the short distance south to famous Sandy Beach and then to the enchanting town of Hoi An - declared World Heritage Site (approx. 4 hours). Once a thriving river port, the town's architecture has been preserved and restored. This small town is a favourite with Active Travel Indochina travellers, and wandering the streets and narrow alleyways brings hours of pleasure and discovery. Today's trade is in ceramics, wood-ware, paintings and tailoring. There is something here for everyone and it is the perfect place to pick up gifts for those at home. There are options here for a visit to the World Heritage My Son Sanctuary, the traditional handicraft villages of Kim Bong carpentry, Thanh Ha ceramics or simply lazing the day away on a neaby beach. We transfer to Danang Airport for a 1 hour flight back to Hanoi, you are met and transferred to your hotel in Ha Noi. Today is at your leisure until our transfer brings you to the airport for the flight home. Tour ends. • Personal expenses such as: Telephone, laundry, and bar bills.